Vines adorn the Addison Sod House in 1929. When early homesteaders arrived to claim their quarter section of western Canadian prairie, sod was often all they had to build temporary homes. One has endured nearly a century. If you follow Highway 21 north of Kindersley, Sask., then turn east on a dusty road called Gleneath, past scores of oilfield pump jacks that dot the horizontal landscape, you’ll come to a house that should have dissolved into the prairie at least 90 years ago. 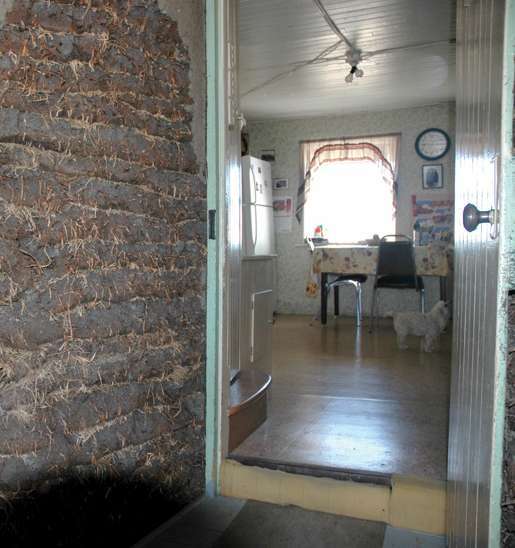 The Addison Sod House is the last one of its kind standing in Western Canada. From the late 1800s to the First World War, sod houses, affectionately dubbed soddies, were often the first structures set on a new homestead. Built in late summer with only a few months before the blizzards arrived, the temporary sod house served as living quarters until lumber could be procured for a proper dwelling. Mostly abandoned after that, the wind and rain claimed them back to the earth. It is not known how many of soddies were built by those who settled on the treeless prairie landscape, but they were raised where they were needed and they housed more than just people. Approaching the Addison Sod House down a long driveway past a gorgeous garden of corn and sunflowers, you are first struck by the fact that the old dwelling doesn’t look like a soddie. The only giveaway is the crazy angles of the outer walls—wide at the bottom, tapering to the top not unlike a Middle Eastern ziggurat. Equally mystifying is the apparent lack of sod; the original walls are hidden behind protective vinyl siding. My visit coincides with a golden September sunrise and the warm greetings from Lenore McTaggart who invites me in for a closer look. She knows this place well: James Addison, her grandfather, started digging the sod to build it 100 years ago. Her aunt, Edith Gardiner (Addison’s daughter), lived in it until a few years ago when she passed away, well into her 90s. McTaggart still spends idyllic summers here. Wrapped in protective vinyl, the Addison Sod House doesn’t show what it’s actually made of. The earthy smell of sod greets the nose as we enter through a doorway flanked by thick pyramidal walls. “I don’t even notice it any more,” says McTaggart as she leads me into the back of the house. Walking through the front rooms and kitchen, it looks the same as any other seasoned farm home. The inside walls have long been plastered and wallpapered, except for a well-exposed stretch of interior wall around the back half. Here it looks like sod ought to look—even-thickness layers of dark and dried soil with shaggy lighter brown roots jutting out at all angles. But it’s solid as brick. After all, these main floor walls support the full weight of the second storey as well as a shingled gable roof. McTaggart takes me up the creaky narrow stairs to the second floor with its two bedrooms and spacious central area. It’s unusually bright. “He built in these skylights,” she says, “long before they were popular.” Pointing out the upstairs window to the north, she shows me the location of the original dried slough that supplied the sod supporting the floor we’re standing on. The selection of sod was important, notes Sandra Rollings-Magnusson who teaches sociology at Edmonton’s Grant MacEwan College. To minimize breakdown from freezing cycles, it was best to select deep-rooted sod from a dry slough. She is researching the lives of pioneer families on the western Canadian prairies and recently completed a book on the role of children, published in 2009 by University of Alberta Press and titled, Heavy Burdens on Small Shoulders: the labour of pioneer children on the Cana­dian prairies. During her research, she searched for settlers’ written memoirs. One was Evelyn McLeod’s 1977 autobiography on file at the Provincial Archives of Alberta. She calculated it would take 2,304 bricks to attain an inside height of eight feet—and that’s not accounting for compression of the sod in its lower layers. “Given that the roof of such sod structures could be enclosed either with hay or straw thatch or with sod bricks laid over a criss-crossed framework of long wooden poles bridging the space between the walls, hundreds of additional bricks might be required to complete the structure,” writes Rollings-Magnusson. 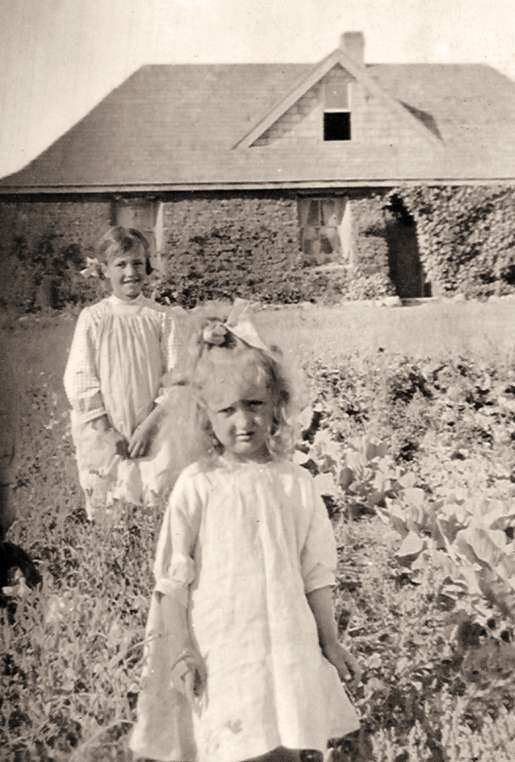 A well-dressed childhood moment at the Addison Sod House in 1912. McLeod also noted in her memoir that they first had to build a cellar under the floor to store food for winter, away from the bone-chilling cold and well-drained so the food wouldn’t spoil. This meant digging out tons of soil and an efficient drainage system by hand. Apart from these improvements, the soddies were crude. Blankets or cowhides were used as room dividers; paraffin-soaked flour sacks for windows; newspapers for wallpaper, reports Rollings-Magnusson. So many other farm chores demanded a family’s labour that precious little was left to further improve these ephemeral dwellings. Thus homesteaders had to endure nuisances, including field mice, insects and garter snakes which continued to live in their traditional environment—the natural sod—even if it did form a wall. And when it rained, regardless of roof type, water found a way in. “Leaks were inevitable, since sod, even if laid in multiple layers, was not waterproof,” writes Rollings-Magnusson. Especially with a sod roof, which soaked up the rain, “a two-day rain outside might leak through and continue for three days inside.” Moving beds to the dry spots and strategically placing buckets and pots was the order of a rainy day. Rain and summer hail, especially when driven hard by prairie winds, would play havoc with exterior walls. Damage and erosion, if the soddie was occupied for more than a few years, had to be repaired lest the wall be weakened and threaten the entire house with collapse. Many did, in fact, collapse. James Addison had noted this fact and so he devised a construction technique to minimize that eventuality—one major reason why his soddie still stands. His daughter related the story in an interview filmed prior to her death, now a DVD produced by Wolf Sun Productions titled, 21st Century Sod House. She was there when the house was being built. 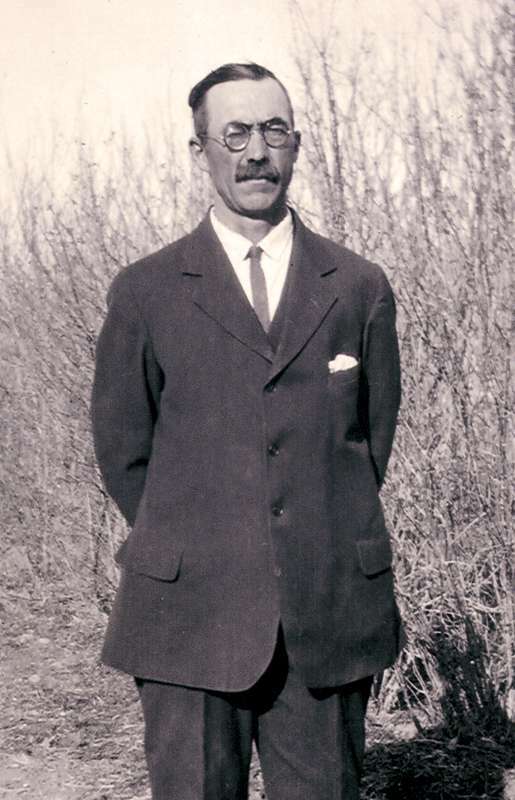 When her father, an experienced carpenter, arrived in Canada in 1907 from Liverpool, England, he at first worked at his trade in booming Saskatoon to save some money, obtain a homestead and send for his family. He got the quarter where the house now stands, sight unseen, for the standard administrative fee of $10, “then in 1908 he came out to find where his quarter was,” related his daughter. Some reports say he walked from Saskatoon to Kindersley, a distance of approximately 180 kilometres. Others say he travelled by ox cart. Along the way, he looked at a lot of sod shacks and noticed “they were falling in, and they were falling out, so he decided they were just constructed wrong,” Gardiner explained. Being an expert builder, Addison knew he could devise a way that was better than simply stacking sod haphazardly one strip on top of another like boys building a play fort. As he plodded across the prairie towards the new homesite, his mind was brainstorming ideas and by the time he arrived, he had it figured out. To ensure a tight concentration of roots for strength, “he found a slough where the grass was high and cut the sod three inches thick. Dad decided he would build the walls four feet thick at the bottom, seven feet high, then taper them to three [at the top],” said Gardiner. But the secret wasn’t just in making the walls larger. The technique was most important. “Every time he’d put a layer of sod on he’d [layer] it…so you didn’t have the cracks coming together,” she explained. And, critically, “he hollowed out the top of every layer.” When the sod dried it would crumble in on itself—toward the centre of gravity—and not fall away to the outside or inside of the wall. These simple techniques greatly improved the structural integrity of the walls. 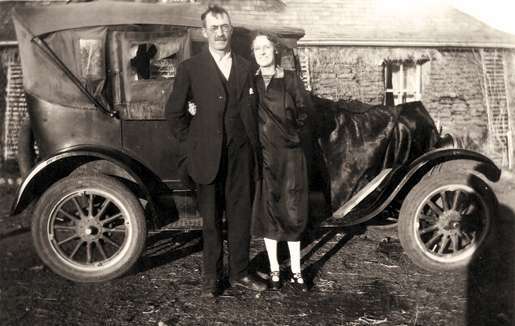 James Addison and his wife in front of car and home. The effectiveness of Addison’s creative building approach was confirmed decades later. In the mid-1990s a team of architectural engineering technology students from the Saskatchewan Institute of Applied Science and Technology, Palliser Campus in Moose Jaw, studied the Addison Sod House design as a term project. They climbed, poked around, measured, tested, photographed and examined every aspect to learn why it stood the test of time. Their conclusion was that Addison’s secret was in the design. Addison, who moved his family into the home in 1911, had plans to replace his sod walls with wood, “but never did,” said Gardiner. Instead, the exterior walls were covered with growing vines for protection from the elements. “But the wind and rain gradually eroded it, so finally he put boards around,” she said. Later these were replaced with shingles, then asphalt and finally the current vinyl siding. Inside tells a different story. The first thing you notice is the earthy smell of sod. It was a good thing they did. Gardiner, who spent her entire life with the house, remembered the improvements as they came along and how they gradually adapted the sod to modern conveniences—like electricity. “Electricity came in with Tommy Douglas,” she recalled. “We didn’t think it was possible, but it did come in the 1950s.” Because the walls were of sod, the electrical cables to this day are visible on their surface rather than the standard routing inside a wall. With the arrival of power came the opportunity for indoor plumbing—with an electric pump on the well to supply water. And Gardiner said when they finally got tired of the old wood-burning stove she telephoned the propane dealer in Kindersley. “He asked if I needed a wall vent or a ceiling vent,” she recalled. “I told him my walls are four feet thick.” A few months after the propane system was installed, she remembered the propane man saying, “You’re not using much propane. If all my customers were like you, I’d go broke.” She attributed the low usage to the superb insulating efficiency of the sod; which is now being re-discovered by conservationists as the latest in energy-efficient housing. 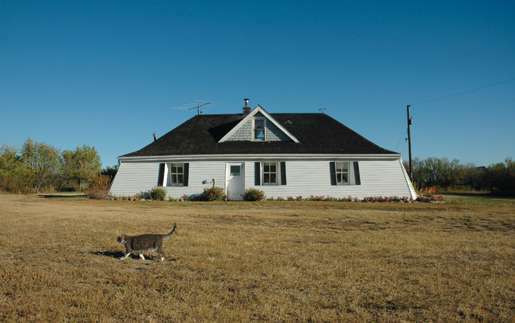 In 1992, the Addison Sod House with its adjacent buildings, trees and gardens was designated a Provincial Heritage Property under Saskatchewan’s Heritage Property Act. 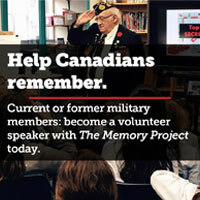 And because it is of national heritage value, the federal government followed suit in May 2004, designating it a National Historic Site by the Historic Sites and Monuments Board of Canada. Next year will mark the home’s 100th anniversary as both a family dwelling and long-lasting soddie. Addison would be proud, and probably somewhat amazed.